September Share to Win Competition. With the Avalonia fashion show coming up at the Manchester Alternative and burlesque fair on the 22nd of September, I decided to team up with the organisers for a little “share to win” competition. If you’d like to learn more about their events you can visit the site here. Simply find this image on facebook and share it on your profile. Please make sure your share is set to “public” so we can confirm that you have done so in the event that you win. The winner will be announced on the evening of the 21st of September 2012. The prize is £50 worth of Eustratia products. More chances to win a free accessory will be given to those who attend the event. I’ve put a lot of effort into arranging the show and expect it to be a fun day. More info on the concept and inspiration will be included in a future post. 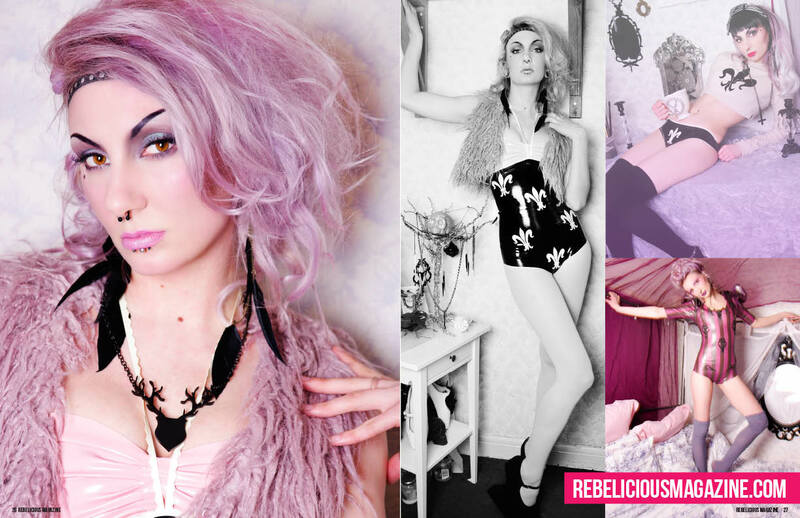 I was lucky enough to have 2 features in this months rebelicious magazine, issue #8. One was an editorial, featuring products from my label, Eustratia styled with different items from my wardrobe. I think some people still have a very set idea of how latex should be worn so I tried to demonstrate that it can be mixed with clothing of different styles and textures. We shot this in my bedroom and I think Jenni did a great job of making it look like a cool place while retaining a personal feel. Beautiful make up by Laura Wilson. 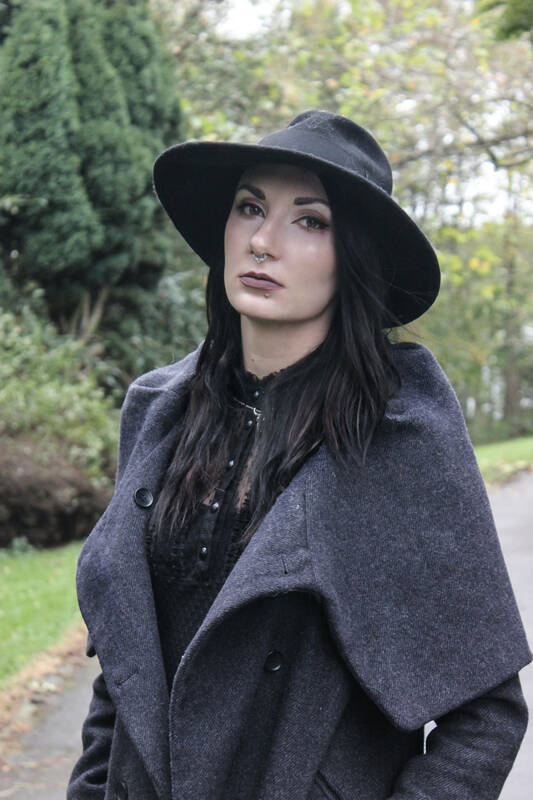 The second feature was a model spotlight with an interview and a few pictures from my shoot with Beverly Ann photography that I edited with pastel colours. The awesome chainmail stuff is by Richard Ayres and the head chain is one of my favourite new items, it’s available to buy online here. The writing is a bit small on the images so I’ve copy and pasted the interview here for anyone who would like to read it. What inspired you to start modelling? Images have always been a source of great inspiration for me. I enjoy looking at creative imagery and I guess my love of modelling started from looking at pictures and seeing a theme that I wanted to interpret or a story I wanted to tell. Styling also plays a big part for me. A lot of my shoots are mostly about an outfit I wanted to put together and the setting I thought it should be worn in. I like creating characters in my pictures. I think people are crystals with many facets and it’s interesting to see how they can be transformed through images with the air of art and fashion. What have been some of your favourite photoshoots so far? I love many of the shoots I’ve been involved in but the ones that stand out most for me are not the ones that turned out the most attractive pictures of me, but the ones were I felt a whole new environment was created or a certain feel was communicated through the picture as a whole. I like a bit of fantasy in my images, even if the subject is something as simple as sitting on a bed. 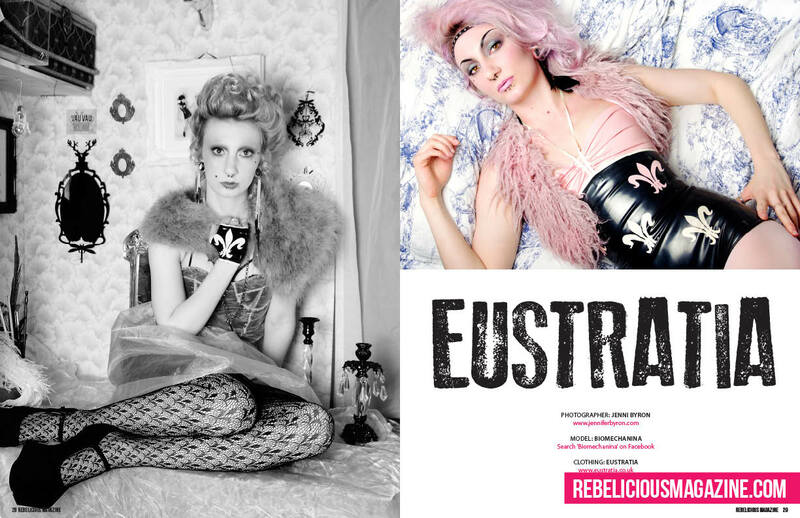 Some examples of shoots that have really fulfilled these are: Firstly, the wonderland shoot I did for my label Eustratia with Toria Brightside, modelling alongside my friend Sapphire Black. I knew everyone involved in this shoot personally so they indulged my crazy idea of driving to the woods and carrying furniture down a long, nettle ridden path so we could arrange it around this specific tree that I had discovered a week earlier. I love the images because I really get the feel that we live under a tree and wear latex every day. Secondly, the shoots I did with Jennifer Byron in my house. My house is not very big or glamorous and wouldn’t normally be suitable for photoshoots but I think we made it work. The first set we did was in the living room and I covered the floor with leaves and twigs to create and inside-outside kind of feel and the second one was in my bedroom, just as it was but using some interesting angles. What I like the most about the images is that they have a certain every-day quality, as well as something a bit different that makes them special. This is how I want to think of my every day life. Lastly, I think the white medical suspension shoot I did for Valentinafetishdoll.com is worth a mention. I was covered head to toe in white latex and wearing ballet shoes, the room was also all white with a medical look and I was suspended from the ceiling by chains attached to cuffs. There was a toy-like, surreal quality to it that came across in the pictures. It was as if I was a doll in my little environment, light and able to pose in positions that normally wouldn’t be possible. As well as modelling, you also run your own latex company Eustratia. How did that begin? I’ve wanted to be a fashion designer since I was 8 and have my own company since I was 18. I originally thought I would finish university and get a job for a while first but while I was there I realized I could only have the job that I wanted if I created it for myself. Latex clothing had always intrigued me since I didn’t know how to make it and after trying out a few samples I decided to make half of my final collection in latex. I latex used parts of that to form my Dyad collection, the first collection I released under Eustratia. What are your thoughts on the ever-growing popularity of latex clothing? I like the fact that latex is becoming more popular and more people are being introduced to it, it would be nice to see it free of taboos and being worn in all sorts of places. I did feel it was more special before though. 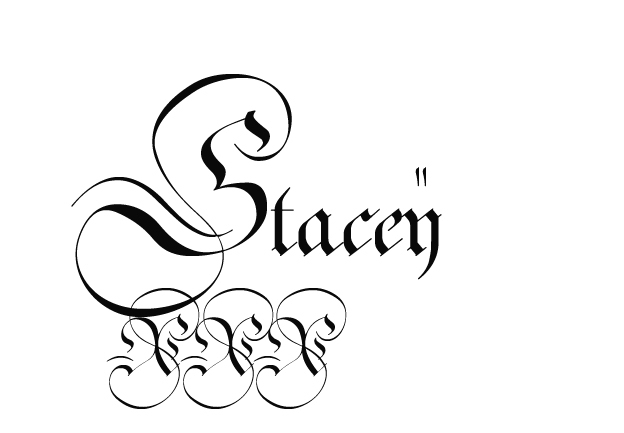 I keep seeing new latex designers popping up without noticing much diversity in the type or style of products available. This fact, along with the visible imperfections on some of the garments I’ve seen online leads me to believe that a lot of them haven’t put much thought into starting a business. I’d like to urge anyone new to latex fashion to do research of their own before purchasing an item. How would you describe your own personal style? Are there any makeup/beauty products that you can’t live without? 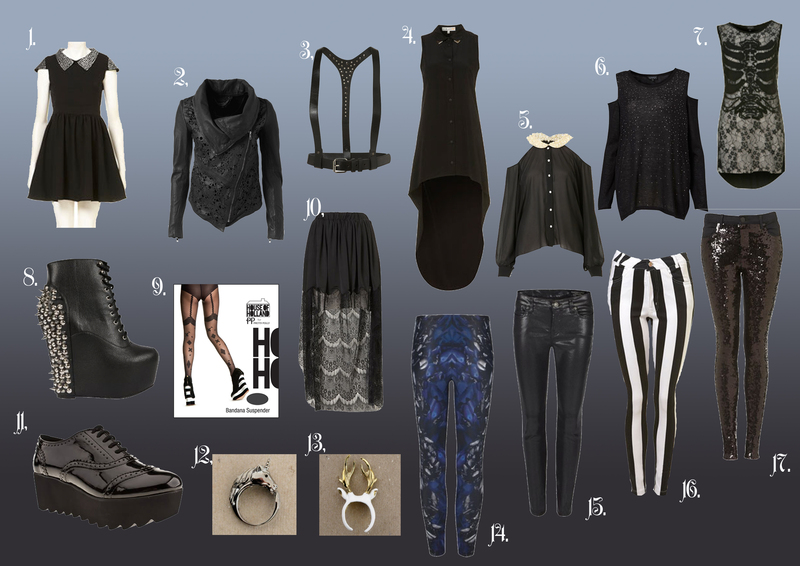 I would describe my style as quirky and fashion-aware with dark undertones. I change my style slightly every couple of months depending on what new elements of fashion I’m experimenting with. At the moment my top accessories are headbands and statement earrings. Also I can’t live without my babyliss wave envy styler, tarte mineral face powder, NARS highlighter and Rimmel waterproof gel eyeliner. With the modeling industry growing constantly, what’s your personal view on the ‘alternative modeling’ scene as we know it? I feel the alt modeling scene has changed a lot in the last 10 years. Alternative models in general are a lot more popular now and almost every photographer is happy to have some sort of alt work in their portfolio. This is great because there is a lot more high quality work around and alt models can get the publicity and recognition they deserve. It has also caused more of a cross-over between alternative and fashion photography which is probably my favourite thing about it. I have also noticed a rise in new models complaining about designers not lending them items for photoshoots or not replying quickly enough, and would like to add that a few years ago someone who wanted to start modelling had to buy their own wardrobe. This plethora of young designers that are happy to lend their items to anyone who fits their vision in exchange for photos is a new thing. I think collaborations are great and it’s nice to see everyone working together and reaping the rewards but it’s important for everyone to respect each other so it can keep on happening. Are there any designers/photographers/other models that you would love to collaborate with one day? There are so many talented people around it would be impossible to list them all but some people who I would love to collaborate with one day (and whose work you should check out) are: Tim Walker, Eugenio Recuenco, Kirsty Micthell , Rachel Freire, Rik Owens, Junko Mizuno, Stuntkid, bitching and junkfood, Audrey Kitching, Charlotte Free, Adrej Pejic . In 5 years I expect to have stopped modelling and be focusing mainly on my fashion label. I have plans to expand and offer a variety of different products. I would normally say that I hope to have a store of my own but in the current economic climate I don’t know if that’s a bit overconfident. As a sideline, I might concentrate more on my illustrations or take up photography as well as continuing to work on my blog, aestheticcontradiction.com. What advice would you give to anyone that may be thinking about becoming a professional model? Being a professional model is hard and living exclusively off modelling is even harder. Most models I know have a different job at least 2 days a week. You should get into modelling because you love it, not because you expect to make money. Like all creative professions it requires a lot of extra work and sacrifices. It helps to know a bit about trends in photography and fashion so you can help produce something current. Have a look at what other people are producing but don’t get caught up in it. Look after your skin and body, I’m not saying you need to be stick thin, especially in the alternative industry but a toned body always photographs better. Study and memorise poses. A lot of new models don’t have variety in their poses. I understand feeling self-conscious when you try out something new but no photographer likes looking through 100s of pictures of you pulling virtually the same pose/expression. You either have to take a lot of chances, or try things out in the mirror and remember what looked good. Taking inspiration from others is also helpful but remember, different people suit different things! Just because “Mosh” looks good doing something, it doesn’t mean you do. Keep a look out for wardrobe that you could use in a shoot, even if you usually work with a stylist. Learn how to do basic hair and make up, there might not always be an MUAH available. Make sure you have good shoes. No one ever mentions this when they give model tips but shoes can make or break a photo. It isn’t that expensive to buy nice shoes nowadays so make sure you have a few statement pairs that go with all the usual styles you shoot and try and keep them as clean as possible if you also wear them out. Attitude wise, it’s good to be professional and polite but don’t take it overboard by being too serious or quiet. Everyone I’ve ever shot with enjoyed having a chat and some fun while shooting, regardless of the level they were at. I would say it’s good to know what you want from a shoot and have your own ideas that you can suggest but don’t be too precious about them. Ask people if they’d like to collaborate but don’t expect all of them to reply. Hassling people for replies or not replying quickly enough will never work in your favour. Don’t be afraid of rejection. The fact that you’re not right for a specific project/brand does not mean that you’re not beautiful/a good model. Being good at self-promotion is always a bonus. Let’s face it, the more people know about your work, the more work you’re going to get. There are lots of debates about the right way/ amount for models to promote themselves but I’m just going to say do what you feel comfortable with and try not to compare yourself to others. To see more images from these shoots, please visit my facebook pages, Eustratia and Biomechanina.